Happy Tuesday! It’s the beginning of the week and I’m already thinking about dinners (well everyday I think about dinner and what to make) but some days are harder than others. Know what I mean? You can have your refrigerator stocked with all the goods but the hard part is deciding on what to create with your ingredients. So luckily I LOVE to figure out what to make for dinner isn’t it? 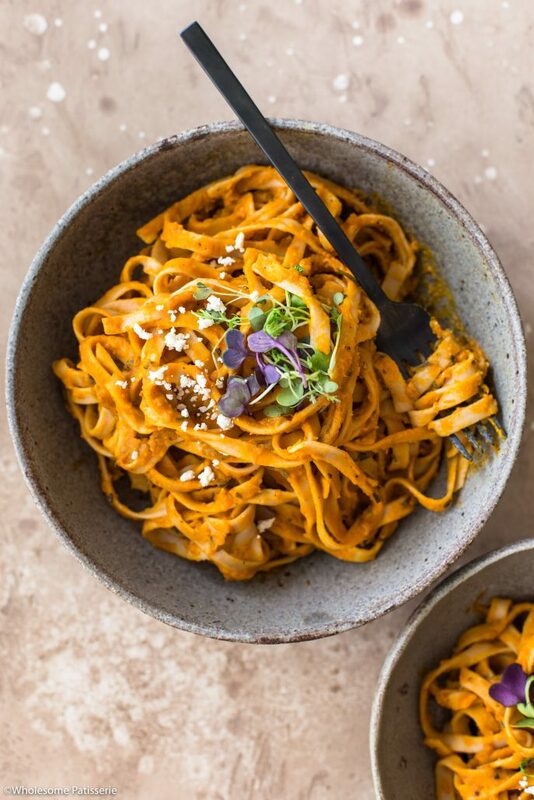 One recipe I created the other day is this delightful Pumpkin Fettuccine and this pumpkin puree sauce is absolutely divine, you’ll have to try it for yourself to believe me! I had a lot of pumpkin on hand so I ended up making a batch of pumpkin soup and this pumpkin fettuccine. 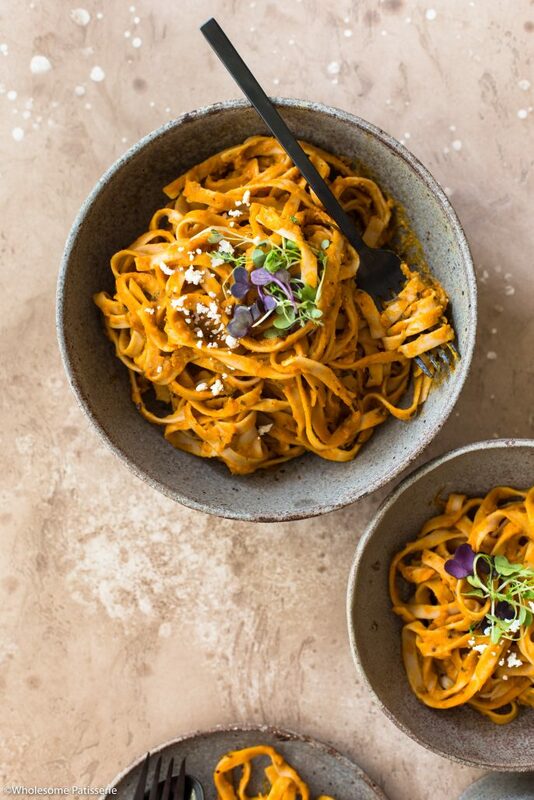 I had this idea for a roasted pumpkin pasta sauce all last week and I couldn’t wait to get into my kitchen over the weekend to create this fettuccine I’ve been building in my mind. You roast the pumpkin, onion, garlic and seasonings so they have that brilliant depth of flavour. You then process that roasted veggie mixture into a smooth puree/creamy pasta sauce, cook your fettuccine pasta and you’re done! How good is that? The first time I taste tested this roasted pumpkin sauce, oh.my.god, we need to take a moment just for that flavour that shines through! 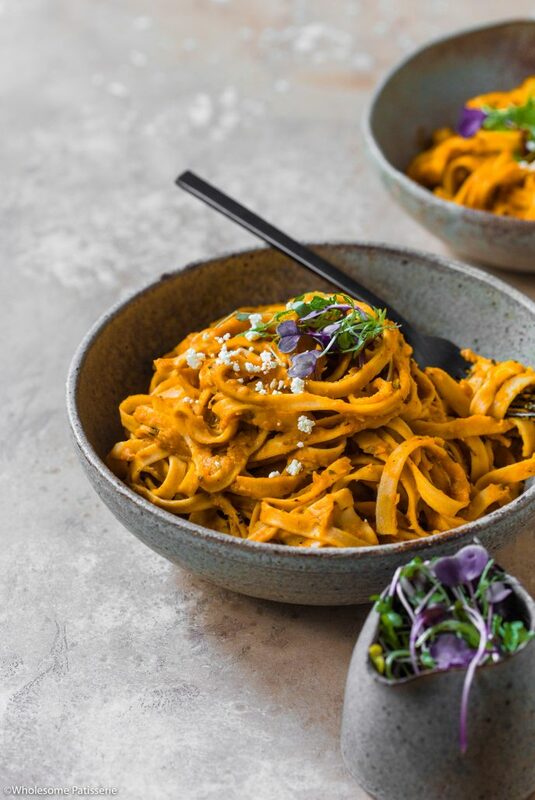 So add this delicious pumpkin pasta meal one evening to your weekly dinners and you’re set! It’s heartwarming, creamy and incredibly tasty, enjoy! Pre-heat oven to 200ºC (400ºF). Roughly chop pumpkin into medium sized cubes. Spread cubed pumpkin over a large oven roasting tray. Scatter over chopped onion and whole garlic cloves. Sprinkle rosemary leaves over pumpkin and season with salt and pepper. Roast in oven for 25-35 minutes or until pumpkin is completely tender and soft. Cook fettuccine according to packet instructions. Whilst the pasta is cooking, spoon roasted vegetables into a high-speed food processor. You can also use a blender for this step. Pulse on high speed until pumpkin turns into puree and the sauce is thick and smooth. Once pasta is cooked, drain off water and add to a large mixing bowl. 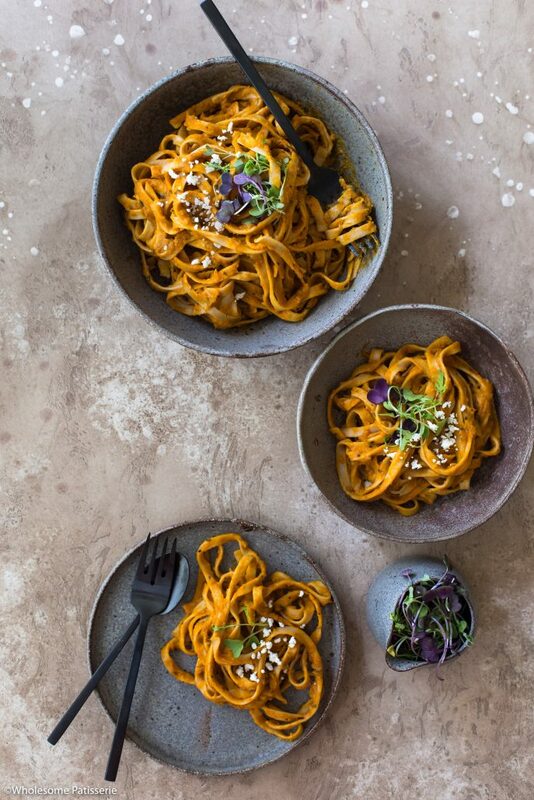 Pour pumpkin sauce over fettuccine and gently mix through with a pair of tongs until well coated. Add to serving bowls and top with micro greens and crumbled feta. Serve with garlic bread if desired and enjoy! Store leftovers in an airtight container, refrigerated, for 2-3 days.